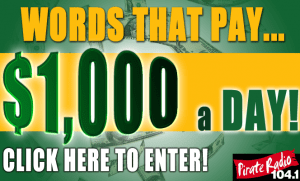 104.1 Pirate Radio’s Words That Pay! Listen to 104.1 Pirate Radio from 6am to 12am Monday though Friday for your chance to win $1,000 each day! Just listen for the Word That Pays during those hours then enter it HERE for your chance to win!